The Scriptures affirm the latter to be the case. All around us a battle rages, yet quite often we are oblivious to it. It is vital that every Christian understands the reality of spiritual warfare and knows how to effectively fight the good fight of faith. 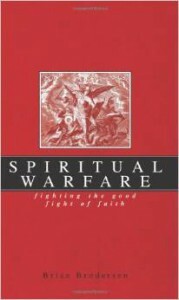 In this book, Pastor Brian Brodersen brings biblical balance and practical insight to the subject of spiritual warfare. Spiritual Warfare was written to heighten the Christian’s awareness of this spiritual battle and its reality in our daily lives. It was also written with the hope of bringing a biblical balance to a vitally important, but often misunderstood subject. My prayer is that God will use the truths herein to enlighten and strengthen His people in the fight of faith.